If you are looking for the best humidifier for your baby, then this comprehensive buying guide is all you need. When you’re expecting a child, you want everything to be perfect before you bring home the most precious of additions to your family. From just the right shade of color on the nursery wall to the quality of the very air your baby will breathe, nothing but the best is acceptable. The shade of paint on the wall is easy; the air quality in the baby’s room is a bit more complicated. Maintaining the proper indoor humidity at a level that is optimum for baby’s health should be near the top of your list. But what do you really know about which product is the best humidifier for baby’s room? If you’re like most of us, it isn’t a topic with which you’re readily familiar. With so many models and styles on the market, how is a parent to know what to look for when shopping for the baby’s humidifier? The humidifiers of today are far superior to the ones our grandparents used. Whether you get a tabletop model or a larger console style, there will be certain frequent maintenance procedures that must be carried out routinely. The humidifier works because of a water reservoir, so the water has to be changed daily. The reservoir should be cleaned and dried on a daily basis to prevent bacteria and mold from setting up a colony inside the humidifier. If the model you purchase allows the use of tap water, it should probably be cleaned regularly with a solution of vinegar and water, and maybe even disinfected with a bleach solution to prevent the accumulation of mineral scale. Most humidifiers will have some type of filter or wick that will require cleaning and/or replacement on a regular basis. If the tap water in your home is hard water, this could reduce the humidifiers’ output and encourage the buildup of mineral scale. A simple solution to this problem is to use distilled water. This can be purchased at a very low cost at most grocery stores and pharmacies. Safety should always be a paramount concern when selecting any equipment to be used in a child’s room. Humidifiers are no exception. Humidifiers, whether tabletop models or consoles, should be placed on a flat surface. It should not be placed on the floor, which would put it in proximity to children and pets. It should be out of reach. If planning to move the humidifier, even a few inches to adjust the positioning, always unplug it before moving. It should also be unplugged when it is not in use. Warm water humidifiers are especially dangerous when placed in children’s rooms. Burns can result from accidental exposure to the hot steam and some of the surfaces of the unit may be hot to touch. Some manufacturers produce and sell humidifiers that resemble cute little animals, such as penguins, frogs, or pigs. While these are adorable and look cute to mothers-to-be, keep in mind that in a child’s mind, it will look like a toy. Even if the penguin-shaped unit you purchase is a cool-mist model, a child could still be injured when accidentally pulling the unit off the table or turning it over on the floor. Below are details on each of the baby humidifier and also the reasons we picked them as the best humidifiers worth having in your baby’s room. TaoTronics ultrasonic humidifier is arguably the best cool mist humidifier and one that your baby is sure to love. This humidifier consists of a micro porous ceramic cartridge, which helps in removing impurities like magnesium ions, calcium and micro organism from the water. We can easily clean this cartridge without removing it from humidifier. In this way this cartridge protects humidifier from white dust and helps in providing Eco friendly and clean mist. The humidifier is best for parents those always wants healthy environment for their kids. This best cool mist humidifier consists of one inbuilt LED display. This display shows current humidity level of the room, on which mode this is working and on which humidity level this is set. This model has sleeping mode feature means LED light off automatically when humidifier is on sleep mode, and will not disturb you while sleeping. There is no need to wake up in mid night to switch off or on the humidifier, TaoTronics ultrasonic humidifier consists of automatic timer system by this we can set running timing of this humidifier. This timer can be set between 1-24 hours. In this model output nozzle can be easily rotate to 3600 angle for adjustment of cool mist flow into desirable direction of the room. Low level protection system of this best cool mist humidifier, turn off the device when water level reduces. TaoTronics ultrasonic humidifier has dimensions i.e. 8.1 inches long, 5.3 inches wide, and 11.8 inches high. The weight of this humidifier is 3.2 pounds. This humidifier is white in color. This humidifier has capacity to humidify up to 538 square feet approximately. The Water tank of this humidifier has water capacity of 4 gallons which is largest in this category. Main advantage of this humidifier is that it can continuously run for 15 hours with one time filled tank. In this humidifier we can set humidity level from 40% to 95%. This humidifier runs on 120V power supply. This humidifier is energy efficient; this consumes only 30 watts of electric power. Consumer rating is always an indicator that we can use to see how far the satisfaction level goes. This particular humidifier has received tons of positive reviews, with the fewest complains as compared to other humidifiers sold in major outlets. Aprilaire has been manufacturing whole-home humidifiers since 1954 and all humidifier are built domestically. Aprilaire makes high quality whole-home humidifier consists of latest techniques & features. Aprilaire always care people for total comfort & better health. Aprilaire 700 is a whole-house humidifier. This best humidifier is used for mid-size to large size homes. It provides desired humidity & maximum comfort throughout the home. A light blend of blue and grey color makes this model attractive. It consists of full automatic control system. We can also use manual mode while installing this. This model of humidifier is for vertical use. This humidifier includes outdoor temperature sensor. It continuously checks the changes in outdoor temperature. A digital control system automatically provides desired humidity level. This digital system provide accurate information about temperature, humidity etc. This top rated humidifier consists of a display on back lit which provides present level of humidity inside the house. One green light ensures working of humidifier. In this model no need to worry about timely replacing water panel. A yellow light indicates user that it’s time for the water panel replacement. This humidifier also gives service indication through red light. When a red light illuminate that means humidifier requires service or there is a problem in the device. After reading various Humidifier reviews this humidifier provides 1.5 times more humidity as compare to other humidifiers of the same category. This humidifier has 0.75 gallon per hour evaporation capacity. This humidifier can humidify a house up to 4200 square feet in area. This humidifier unit has size of 15.91 inches width, 18 inches height & 10.34 inches depth. Plenum opening size is 14.75 width X 14.31 height. What is plenum? Plenum allows movement of air between parts of the building through a space lying above the ceiling but below the next floor. What makes this Vicks Ultrasonic Humidifier One Of The Best Baby Humidifiers? The Crane Drop Shape Cool Mist Humidifier is just the right choice when you are on the hunt for a compact yet quality humidifier. If you want to protect your baby or be free from dry cough, itchy nasal pathways and dry skin, you have found the right product that can serve you and your family at a very reasonable price. This humidifier has dimensions of 9.8 x 14.7 x 9.8 inches that fits anywhere in your home, may it be your living room or you bedroom. For more information about this equipment, below are several features and benefits you can win in owning one. What Makes Crane Drop Humidifier a Good Choice? Easy to use. With the Crane Drop Shape Cool Mist Humidifier’s simple control panels, you need not to worry about complex instructions that may waste your time and effort figuring out which switch is which for you to enjoy the comfort of having a dust free home, moist skin and a decongested nasal pathway . Highly recommended for allergic and asthmatic persons. Reliable humidifier. With a maximum of 2.3 gallons of output, this product can run up to 24 hours thus giving an all-day mist for your comfort. Plus, a 360 degree nozzle lets you direct at any point in the room. Benefits. 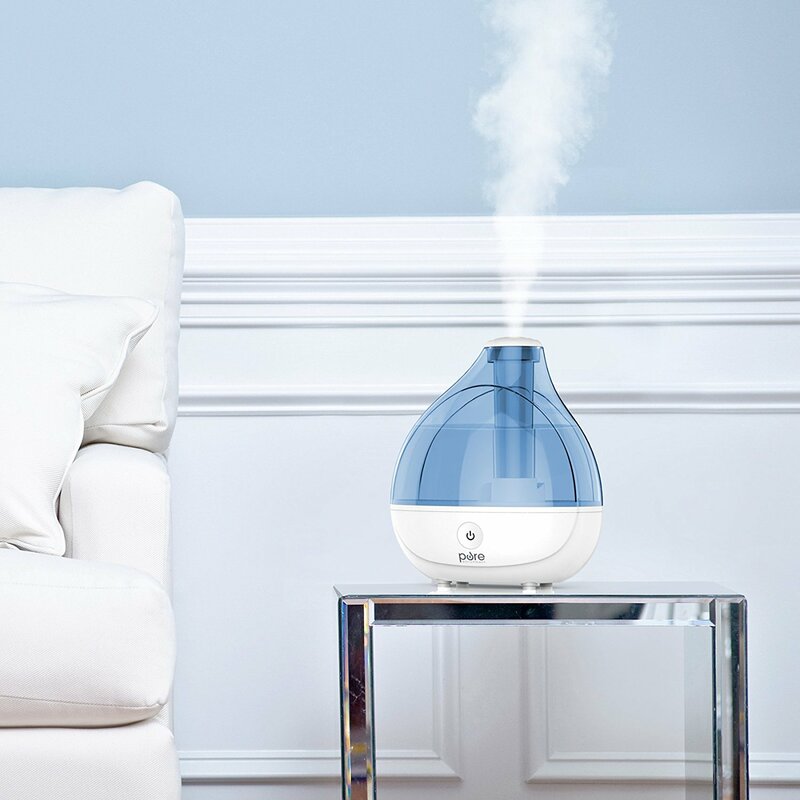 Aside from keeping your home surrounded by cool mist, the Crane Drop Shape Cool Mist Humidifier relieves the discomforts of nasal congestion, dry and itchy skin, chapped lips and dry throat. This is also a recommendation from some physicians to help alleviate common cough and colds. Plus, this humidifier also is beneficial to your home structures such as your walls. This prevents static electricity, cracks on paint and furniture or peeling of wall papers due to winter heaters. Energy saving device. Compared to a standard bulb, this device consumes less power that may lessen your worries on electric bills and electrical overloads. Whisper quiet operation and automatic shut off. This is designed with an efficient muffle system to provide a good night sleep while the device is turned on. It automatically shuts off when the tank is empty to prevent the device from overheating that may cause damage. Hassle free cleaning. You can keep this device sparkling clean in just a jiffy with its easy detach parts and low cost cleaning solutions. Most humidifiers are only good for small distances and short hours, and this is a complaint in many humidifier reviews. For those who need a large, high-output cool mist humidifier, the Honeywell QuietCare 9-Gallon Output Console Humidifiercomes highly recommended. This product is advisable as a humidifier for baby, as well as a warm mist humidifier for all around the house. What’s remarkable about the Honeywell QuietCare warm mist humidifier is its 3 moisture settings and adjustable humidity control. Most humidifiers receive complaints in humidifier reviews because they can’t deliver the preference of the user. Compared to other brands, the Honeywell QuietCare warm mist humidifier ensures user satisfaction. This product also has an auto-turn on feature. It can detect the level of humidity in the room, maintaining user-set humidity. As a humidifier for baby, it assures uninterrupted hours of comfort and relief for infants. Its QuietCare feature sets it apart from other brands according to humidifier reviews. Although large, it doesn’t cause inconveniences for the sound-sensitive user. The capacities of the Honeywell Quietcare cool mist humidifier are outstanding. It has dual water tanks, providing a 9-gallon-per-day output. It can work twice longer than an ordinary cool mist humidifier. In addition to that, it can humidify rooms of up to 2300 square feet. This is very economic and can replace the work of several humidifiers. The Air Washing pre-filter is designed to trap dirt, dust, and pollen. The Honeywell QuietCare cool mist humidifier provides fresh, and breathable air, performing the job of a humidifier for baby. Many humidifier reviews report satisfaction with its Protec Cleaning Cartridge and Antimicrobial treated filter. This helps prevent the formation of mold, algae, fungus, and bacteria. Lastly, Honeywell Quietcare cool mist humidifier has a multi-speed fan that disperses mist according to user preferences. This built-in fan makes it a good humidifier for baby, providing a breathable room for infants and for everyone. What makes this Honeywell one of the best humidifier for babies? Honeywell Quietcare cool mist humidifier operates more quietly compared to most cool mist humidifiers. It ensures both the relief and comfort of the users. Second, it has a wide-range, heavy-duty humidifier that cuts cost by doing the work of several humidifiers. Third, its adjustable temperature settings make it a sensitive humidifier for baby. And fourth, it filters air and makes sure that it is breathable and clean. As reported in humidifier reviews, this product has a ventilation system that blows cold air from one side. Some may find this uncomfortable, but good positioning of the product around the house can solve this inconvenience. All in all, the Honeywell Quietcare cool mist humidifier is a highly recommended product in humidifier reviews. It can work for long hours and produce greater output compared to others. Having quantity and quality, it has filters that remove bacteria in the air, making it breathable and clean. For users who want humidifiers that will work for long hours, while providing quality and comfort, this product is a must-have. When buying humidifiers, it is more recommended to get a unit that can perform two functions at the same time. For example, the Air-O-Swiss AOS 7135 Ultrasonic Humidifier both functions as a cool mist humidifier and a warm mist humidifier. As a consequence, you save more money while enjoying other premium features. One of the common problems associated with humidifiers is the formation of lime scales and hard water residues. This incidence is made less likely with the Air-O-Swiss AOS 7135 Ultrasonic Humidifier due to the demineralization cartridge’s inclusion. The cartridge prevents residue from forming and bacteria from breeding through its unique Ionic Silver Technology. Room coverage: 650 sq. ft. The Air-O-Swiss AOS 7135 Ultrasonic Humidifier is equipped with a state-of-the-art Hydro Stick. The Hydro Stick is an advanced water technology and maintenance system that maximizes humidification performance. As a result, expect that the mist in the room would be of a constant, fresh supply all the time. TheAir-O-Swiss AOS 7135 Ultrasonic Humidifier contains Intelligent Temperature Compensation (ITC) technology. With this smart feature, the humidifier becomes able to regulate the levels of humidity by factoring in the temperature levels on its own. It produces the mist best suited for the current elements existing in your home. The AOS 7135 is one of the most consistent humidifiers in the market. It produces mist quickly and efficiently, but it retains the water level for more than 24 hours until refilling is required again. One of the greatest features of the AOS 7135 is its silence. Indeed, it can even be put as the humidifier for baby’s room or in the bedroom without disrupting sleep. Lastly, the AOS 7135 is very low maintenance. Refilling of water is very easy through its functional and attractive design. Maintenance can be costly. For example, silver sticks and filters need to be replaced at least once a year. The humidity reader on the AOS 7135 is slower and less accurate to the readings of a hygrometer. There are many things to love about the Air-O-Swiss AOS 7135 Ultrasonic Humidifier. Some of the common humidifier reviews cite the 7135’s quietness, ease of refill and operations, less refilling frequency, coverage, and anti-bacterial features as the reasons why they love their unit. Overall, it is one of the best humidifiers in the market. The Vicks Warm Mist Humidifier with Auto Shut-Off is an inexpensive home humidifier that’s not cheaply made. In fact, it is easily one of the best in its price range. This home humidifier has a very large following because it is portable, durable, and very efficient. It has a decent amount of features that extend its functionality and practicality further. If you’re looking for a reasonably-priced humidifier for your home, then this one is definitely a good option. Read on to know what benefits you’ll get from it. What makes it one of the best humidifiers? A fluid capacity that is enough to run for 12 hours without being too heavy and unwieldy. The Vicks Warm Mist Humidifier with Auto Shut-Off has a 1-gallon tank which when filled up can be used without refills for 12 hours straight. You’ll find this very practical and efficient as you’ll only have to refill the tank once or twice a day, depending on how frequent the machine is powered on. Compact and portable design. This warm mist home humidifier measures just 12 x 7.9 x 14.2 inches and weighs just 4.8 pounds, allowing you to fill, carry, and position it almost anywhere in a room. Its size ensures that it doesn’t get in the way; you can tuck it on a corner table or a shelf safely. This is also a great humidifier for travel, especially if you’re dependent on it because of allergies or other reasons. Has two settings for you to choose from. The Vicks Warm Mist Humidifier with Auto Shut-Off has two comfort settings you’ll be able to switch back and forth from, depending on your needs and situation. This way you can set how much warm mist it produces at any given time; giving you great control over a particular room’s humidity and ultimately; your comfort level. Provides you with a way to incorporate soothing agents or medications to the mist. This warm mist humidifier comes with a medicine cup where you can put Vicks Vaposteam, Kaz Inhalant, or other similar products. You can also put medications so you’ll be able to inhale them with the mist. The Vicks Warm Mist Humidifier with Auto Shut-Off has a very efficient design but because its primary function is to produce mist, its tank will drip when lifted out. There is no way around this, so you might want to put this device over a piece of cloth or other moisture barriers to protect your furniture. This is a simple solution and is worth doing, especially when you consider the benefits you’ll get from a machine that is small and inexpensive. Closing down out list of best humidifies for babies is yet another humidifier by Crane. The Crane Cool Mist Humidifier is actually adorable, 1 gallon which makes it more portable. The 1 gallon tank fits into any sink. It is easy as filling it up with cold tap water, switch it on and this Penguin humidifier will produce the cool mist instantaneously. This is great as you do not have to spend excessive time on filtering water. You will also save on filter maintenance and replacement as well. Easy on your pocket and gentle on your mind. If you are looking for a humidifier, something not so luxurious but will do the jobs anyways, then this Crane Penguin shape humidifier is recommended. This humidifier helps ease my medical problems which develop when the moisture drops in the atmosphere. The Crane Cool Mist Humidifier provides an additional comfort for cough, cold and flu symptoms. It also is comforting for anyone who suffers from itchy skin and chapped lips. Another good feature is that the Crane Mist Humidifier gives you a fine mist spray constantly. Furthermore, when the tank runs short of water the humidifier will automatically turn off. It is a great power saver yet again it is easy, convenient and cost efficient. The common issues that people have in finding a humidifier is the exorbitant price, bulky structure, leaking body, high noise level and poor efficiency. However the Adorable Crane Mist Humidifier is compact, light weight and portable. It could be carried around the house and cute even as a decorative item. Further more it is affordable and maintaining it would not cost you much as well. The Adorable Crane Mist Humidifier is easily regulated with one button in the front. It operates on low power consumption and with its 1 gallon tank it provides up to about 11 hours of moisture. A humidifier does exactly what the name indicates: it humidifies the air, meaning it adds needed moisture to the air we breathe. Humidifiers increase the amount of water vapor in the air, either by heating water in an enclosed reservoir or employing other methods to generate unheated mist. Humidifiers use water’s ability to evaporate into an airborne vapor to force a higher percentage of moisture into the air. There are many different models and styles to choose from, but all basically work on the same premise. Liquid water is converted to water vapor and allowed to escape through a vent, thus increasing the percentage of water vapor (humidity) in the air. What types of humidifiers are there? When shopping for the best humidifier for baby, you’ll find there are three general types available. There are small tabletop models that are adequate for one room. If you need something larger, there are console styles that are larger and sport tanks that can humidify multiple rooms, a standard apartment, or a small home. For larger houses, there are in-duct versions that can be used with forced-air heating systems to humidify the entire home. Tabletop models are by far more popular because they are affordable and can be placed right in the child’s room. These models are also relatively easy to clean and lightweight, even when filled. Whatever model or style you decide is best for your needs, make certain that any filters or wicks are easily replaced from a local supplier or online source. The controls should be easy for you to understand and operate, and you need to make certain the tank can be filled beneath the faucets in your home. Tabletop models that use cool most are often marketed and sold as “evaporative models”. This style of humidifier uses an enclosed fan to blow air over a wet wick or moist filter. This motion of the air creates increased vapor in the air by evaporating the water. Other models of cool mist humidifiers may use ultrasonic technology in which a vibrating diaphragm creates the mist. The ultrasonic models are amazingly quiet, compared to the louder evaporative models, and are available in both cool and warm mist styles. One other type of cool mist humidifier is the impeller-type humidifier. This type uses a spinning disc to send fine water droplets into the air. The impeller-type produces a slight hissing sound, however, that may be disconcerting to younger children. The other option, the warm-mist models, have heating units to warm the water. Because these models carry a risk of accidental burns or scalding, the American Academy of Pediatrics does not recommend they be used around children. Models that produce warm mist also use more energy than their cool-mist counterparts. In recent years, manufacturers have begun to produce units that can be set to deliver warm or cool mist, switching between the two modes at the touch of a button. Why Do We Need A Humidifier For The Baby? In the winter, dry climates at 2% to 20% outdoor humidity means the inside is the same. When heat sources are turned on during the winter, the indoor air holds less moisture and dries out even more, it can drop to low as 10%. To add humidity to the air in the room of your child, you can use a humidifier. It helps keep the moisture for the baby’s skin, mouth and nose, and help prevent static shocks. Your baby’s nose will not be bleeding because the mucous membranes in the nasal passages always keep moist. Your baby will feel more comfortable and sleep better. That is important for newborns, older babies, toddlers—everyone who is congested due to dry conditions. A humidifier can be used all year, not just the winter or colder months in some areas. Humidity for a baby ideally should be at between 30% and 50% with a room temperature of 65-70 degrees F (18.3-21oC). Don’t allowing a unit to expel too much moisture can create condensation on the walls. The humidity level is too high also can lead to the development of mold, fungi, dust mites, and other tiny critters. You also need to keep your humidifier clean, otherwise it will send dust and germs spewing into the air in your house. Increasing the indoor humidity level and maintaining it at a healthy level can help reduce the severity of upper respiratory and lower respiratory tract cold symptoms. It can lessen the duration of cold symptoms and alleviate the discomfort of dry skin and itchy eyes. Cold, dry air is a favorable breeding ground for viruses of all types, so running a humidifier in the baby’s room may help prevent your young one from getting sick in the first place. Under ideal conditions, indoor humidity should be maintained in the range of 30% to 50%. Heating your living space in the winter, whether it is a home or an apartment, can deplete the air’s humidity level inside to as low as 10%. In such an environment, it is not unusual for anyone, but especially small children, to experience a buildup of normal secretions in the nasal cavities and respiratory passageways. A humidifier can help alleviate this discomfort by loosening these secretions, helping children as well as adults to rid themselves of nasal and chest secretions through effective coughing. Adults are more effective at clearing their breathing passageways because of their increased size and years of practice removing bothersome secretions. Babies don’t have the advantage of size or any experience on which to rely. Where parents can get flu shots and rely on over-the-counter cough and cold products, a baby has no such remedies available. In fact, the Food and Drug Administration recommends cough and cold products not be given to children under the age of two. The FDA also strenuously recommends that babies under six months of age not receive flu vaccines. A humidifier in the baby’s room, and others placed throughout the home, can afford some relief to the child suffering cold symptoms and congestion. Every mother knows the benefits of a bulb suction and saline drops or fine saline mist spray. A humidifier can be used in conjunction with these time-tested treatments to help the baby breathe easier, even when sick. The humidified air can help decrease nasal stuffiness, keeping the nasal passages more comfortable and the airways of the chest moist and less irritated. Selecting a humidifier may involve some compromise in efficiency to get a quiet operating noise level, or a higher cost for increased convenience. But some basic features should be considered when choosing the best humidifier for babies. First of all, the humidifier should be easy to use. If choosing a tabletop model, it should be easy to move and to clean. If selecting an evaporative model, make sure the wick is easy to remove and replace. User-friendly digital controls that include easy-to-read displays are important, and the display should include humidity levels as well as settings. The humidity level should be controlled by a humidistat. This control should shut the unit off when it reaches your selected humidity level. Models equipped with a humidistat tend to cost more, but the extra cost is generally considered to be worth the investment. If the humidity level in a room gets too high, it can cause condensation on windows and walls. This excess humidity can promote the growth of unwanted mold, bacteria and dust mites. Some tabletop models and console style of humidifiers come with a timer that lets you set the unit to come on at a preset time. This is especially useful when you’re going to be away for a period of time. The timer feature can allow you to have the humidity level in baby’s room just right when you return home. Just be certain to dry the unit thoroughly between uses to avoid bacteria growth from the water sitting in the tank for extended periods. Some humidifiers will also turn themselves off if they run out of water. If using an evaporative model, however, it is desirable to have the unit run for a period after the water runs out to prevent the filter or wick from drying out. A dried out filter or wick encourages the growth of mold and bacteria. Some newer models feature a permanent filter that doesn’t require changing, which is an added convenience. Regardless of which type you purchase, you will need to perform routine cleaning and disinfecting. Humidifiers are favorite growing regions for molds and mildew. If you will be using one on a regular basis, be prepared to accept the responsibility of cleaning it frequently, and cleaning it well. Mold only needs 48 hours to set up house in your baby’s humidifier, and once it begins to grow, it can be transferred into the air and to your baby. Humidifiers should be diligently cleaned according to the manufacturer’s instructions. If a humidifier is going to be idle for a period of time, it should be drained and thoroughly dried before being stored. Even units that include antimicrobial finishes on the tanks and surfaces can become slimy with mold buildup if they are not cleaned and disinfected. Some newer units may include technology designed to reduce the growth of bacteria. Including such features as silver ion technology as a way to treat plastic to prohibit bacterial growth, or ultraviolet light is becoming popular. However, even these advanced measures are inconsistent if not used in conjunction with a regular and thorough cleaning regimen. Hopefully our guide has been helpful in guiding you to get the best humidifier for your baby or growing kid. We all want the very best for our children. If we can prevent them from suffering some of the common ailments of childhood, such as the common cold or stuffy noses and chest congestion, we’ll gladly pay whatever price is necessary. Something as simple as a humidifier may be all that’s needed to make the difference in how well your child navigates the many trials and tribulations of growing up. There are choices for parents when it comes to what is best for your baby’s health needs. Whether you want a humidifier that is small and portable, or one that is a larger console model that rarely moves from its designated spot, there are options that you should consider when preparing your baby’s room. Cool mist or warm mist. Digital controls and timers. Tap water or distilled water. Tabletop or console. Whatever model you decide on, your baby’s room will be that much more comfortable and cozy because of it.